Today marks the beginning of Mathematics Awareness Month, and this year’s theme is Martin Gardner. Coincidentally, I recently returned from my second trip to the Gathering 4 Gardner (G4G), a recreational math conference with a focus on the sorts of things that Martin Gardner wrote about in is Scientific American column, such as puzzles, magic, mathematical art and other recreational mathematics. 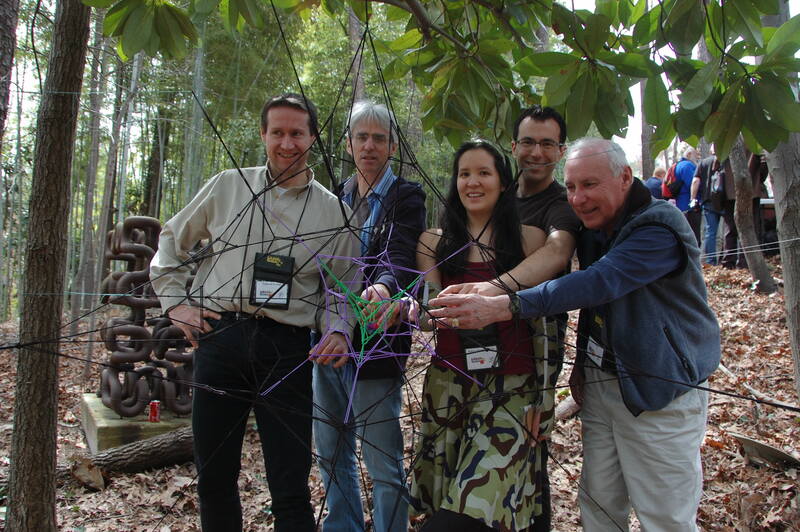 Pretty much everyone who attends is really neat and has done something really cool that was directly or indirectly inspired by Martin Gardner. A number of the attendees are actually professional magicians and one highlight of the event is the astounding evening events and shows. In addition to organized talks, the highlight of the conference is often just talking to people. I know quite a lot about polyhedra, but I had an interesting discussion with John Conway (who also had the honor of being the theme for this year’s conference) about the naming of the rhombicuboctahedron where I learned some new things that I hadn’t known previously. My favorite part of G4G is an afternoon excursion devoted to talking and learning things from other attendees, and also to large art sculpture “barn-raisings”. 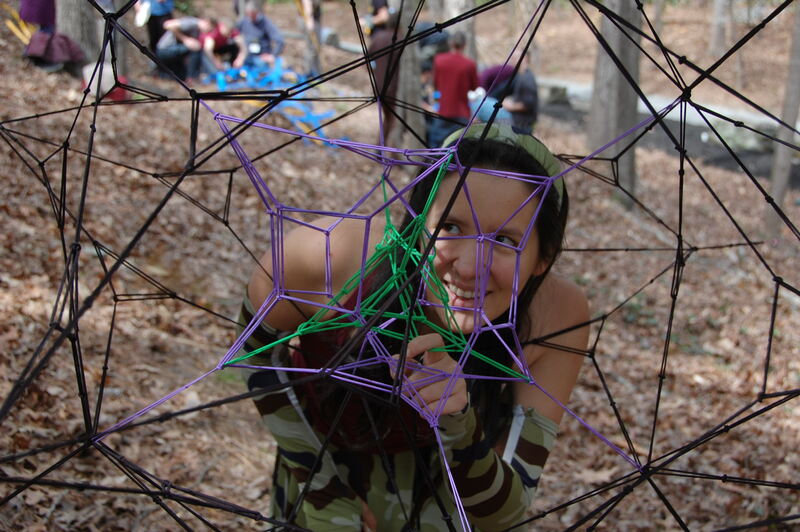 I was one of the six artists that participated in the sculpture event and organized a group to make a construction out of hair bands, a fun precursor to my later talk on a hair tie 120-cell (a 120-cell is a regular 4-dimensional polychoron made out of 120 dodecahedral cells). My creation used a technique for making large geometric constructions out of hair ties that I learned from Zachary Abel at the last G4G. Here’s a picture of some the team that helped me construct the hair tie construction. Thanks to everyone that helped! The hair band construction consists of a tetrahedron of green hair bands inside a cube of purple bands, inside an octahedron of black bands. You can see the tetrahedron in the cube fairly well in this close up shot. 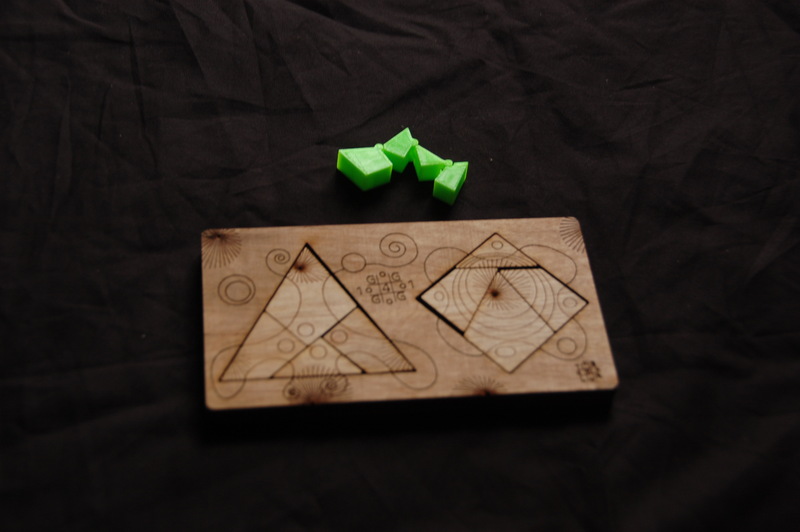 G4G has a formal puzzle and art exchange as well as many informal ones. Here are a few of the neat things that I got from G4G11. If you were in doubt about my claim that the people that attend G4G are collectively really cool and amazing, these pictures should probably lay your doubts to rest. 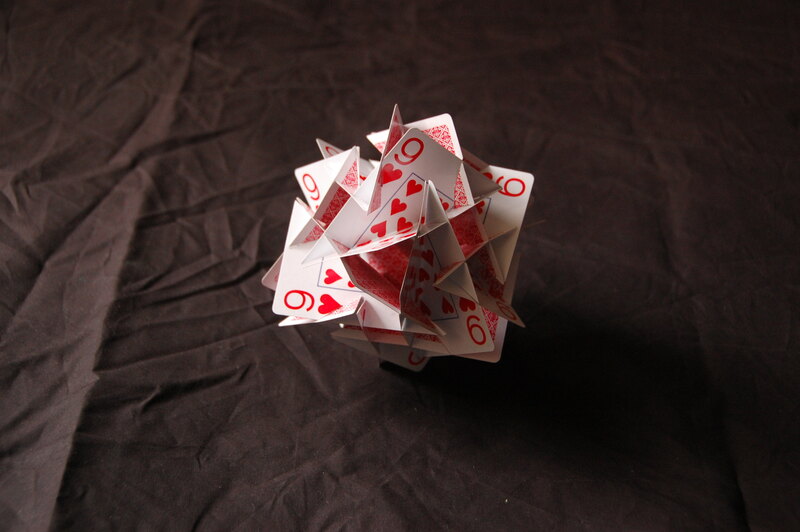 George Hart’s gift exchange item was a set of pre-cut cards that assemble into a Tunnel Cube. Edmund Harriss laser cut sets of paper pieces that cleverly slotted together. 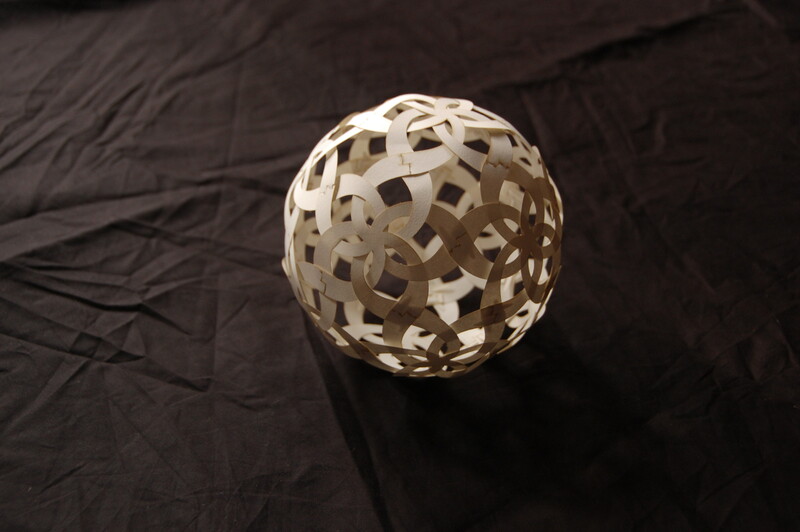 I took two chiral sets of five-pronged pieces and combined them to make this neat woven ball. 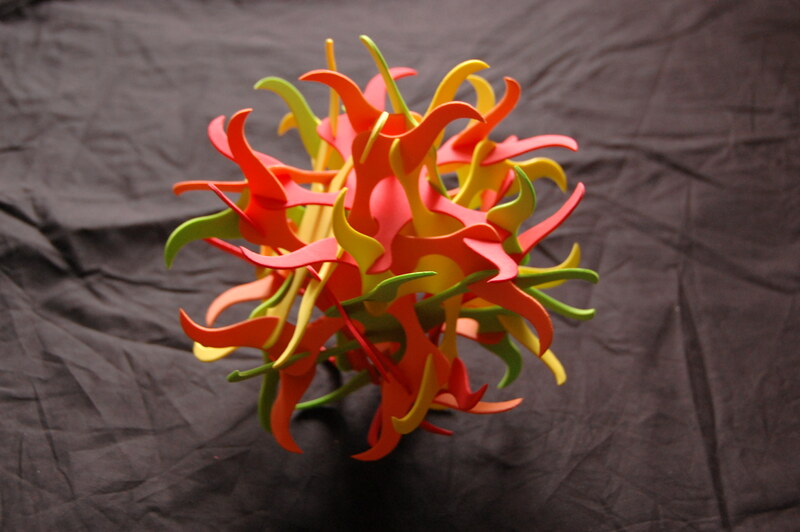 Eve Torrence gave me a set of pieces for her gorgeous “Small Ball of Fire”. I love the choice of foam as the material, as it is very forgiving and easy to assemble. I got this surprisingly fun and meditative marble labyrinth from Bob Bosch. Finally, the gift exchange includes many fun puzzles and papers that are interesting, but not as photogenic. 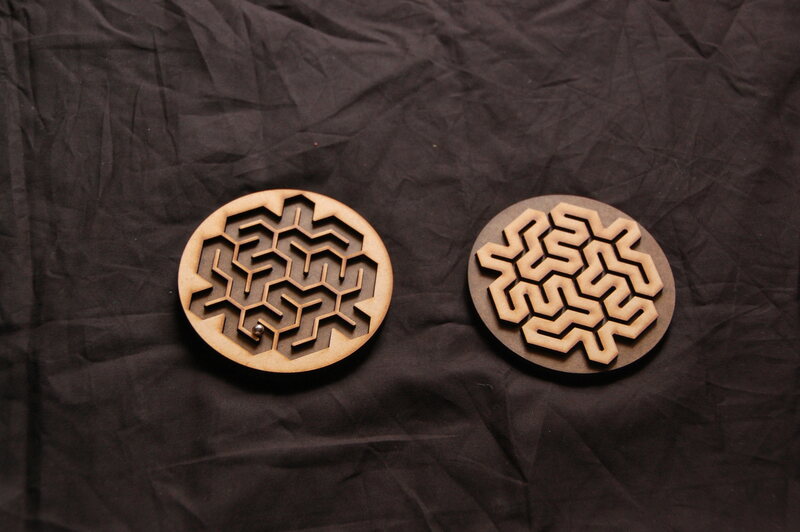 I particularly liked the “turn MI into MU” (solvable variant) puzzle from Henry Strickland. In my next post, I will talk about my own G4G exchange gift, that you can construct at home even if you didn’t attend G4G! This entry was posted in Life, Math Art, Recreational Math and tagged math art, puzzles, recreational math on April 1, 2014 by hawksley.